More and more often we hear about Functional Training, but in the end what does it mean exactly? What type of course do we have to expect? What do you do in this workout? Let’s see what it is! Train the body to perform functional movements to daily life, Contrary to what happens, for example, in more specific training, where each exercise is designed to develop and exercise one particular muscle group at a time. 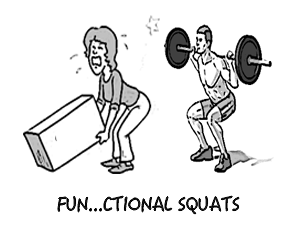 FUNCTIONAL SQUAT:LEARN TO LIFT WEIGHTS! 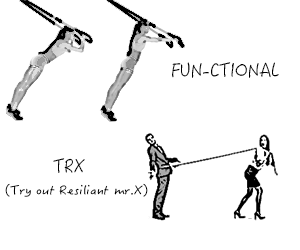 FUN- CTIONAL TRX… or CROSS THE FITNESS WITH FUN ? Conclusions? 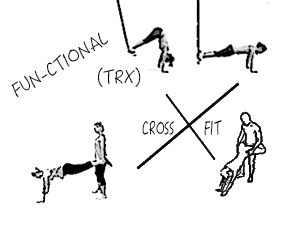 It ‘s a complete workout, which is inspired by all kinds of training (classical gymnastics, climbing, acrobatics …). It uses bodyweigh and/or equipment that helps to get in special conditions (height, gravity, external weights) imitating possible situations of everyday life (functional training). 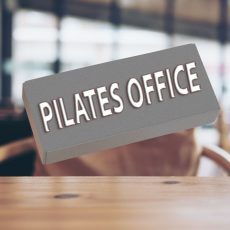 The aim is to keep fit (core training), learning how to have a good awareness of your body in space (proprioception), and by understanding how to activate muscles (kinetic chains). ← CHOOSE A TRAINING OR THE TRAINER?